You (or your family members) are a regular smoker. You are fed up of the smell of cigarette smoke, cigar odor or cooking smell. It’s time to get rid of smoke inside your home in the most effective way. Let’s find a best air purifier for smoker in 2019. UPDATED: We have updated our list of best air purifiers for smoke (cigarette smoke and cigar odor) in 02/28/2019. In Breathe Quality, we keep updating our posts whenever possible, and this update is the result of a 3-month consecutive experiment in our labs, so we can make sure that you will get the right air purifier for your cigarette smoke and odor. 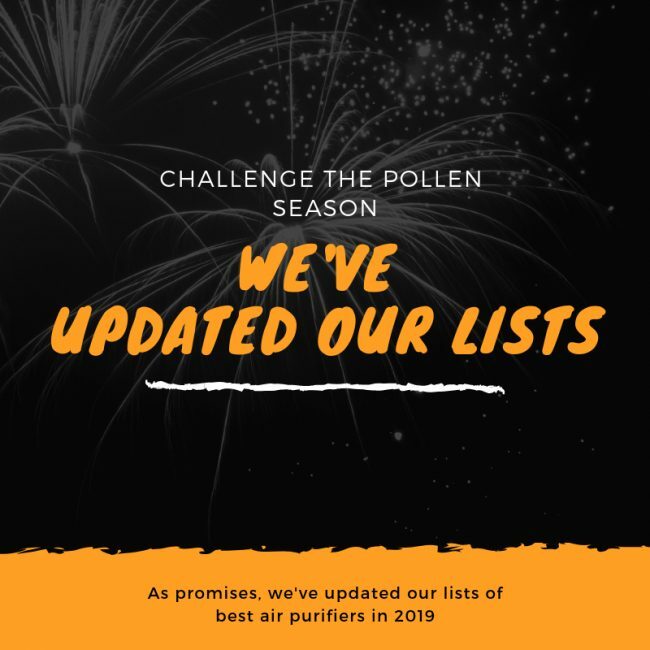 Our next update will be set for 3-6 months later, depending on the release of new products from the well-known air purifier brands. However, you don’t need to wait, because the air purifier market will never change so quickly. It is difficult for anyone to give up smoking. Buying a best air purifier for smoke in 2019 is clearly the most efficient way to help you eliminate the smoke and smell at the moment. The Breathe Quality has tested and considered many of the top air purifiers up until now, and here are our absolute favorites. This Comparison Table of best air purifiers for smoke will help you have a quick overview of our list of Top 10 Best Air Purifiers for Smoke (Cigarette Smoke, Cigar Odor and Cooking Smell) in 2019. The factor for comparison in this table is the Filter Types of this air purifier, which you should check for the Activated Carbon filter and True HEPA filter. We also give the most concerned factors as the Room Coverage, and links to the filter replacements. Remember that you should check the reviews of this comparison table. We will share all the knowledge about the pros and cons of each air purifier to help you understand why we choose these 10 as the best air purifiers for smoke in 2019. Our first device for this list of best air purifiers for smoke in 2019 is from IQAir – a well-known Swiss brand. To guarantee the quality, IQAir became the educational partner with American Lung Association. And their IQAir GC MultiGas is what they proudly called the #1 Air Purifier for Smoke. At the top of the company’s air purifier lineup, the IQAir GC MultiGas is for those who are desperate in need of an absolute solution for smoke, odor and smell. HyperHEPA filter – The first stage of filtration features a powerful True HEPA pre-filter, which can capture 99.95% of particles down to 0.3 microns, and 95% of particles as small as 0.003 microns. In short, this is a medical-grade filter that can stop even the tiniest viruses. Cartridge-based activated carbon filter – Made with 12 lbs of the highest quality ABS plastics, this filter can remove VOCs and odors effectively. Cartridge-based chemisorption – This stage destroys harmful chemicals, such as formaldehyde and other toxic smokes. Post-filter sleeve – A post-filter sleeve wraps each gas cartridge to prevent media dust from being released. The Swiss Made high-end air purifier IQAir GC MultiGas is built in such outstanding quality and superior design with the 3D Ultra Seal, to make sure the filter media is 100% sealed in the filter frame and prevents any internal leakage. Plus, the internal power of this air purifier is flawless, too. There’s a double stage of cartridge-based Activated Carbon filter with 12 lbs of the highest quality ABS plastics, IQAir GC MultiGas will absorb any types of smoke, wildfire smoke, household odors, formaldehyde and even Volatile Organic Compounds (VOCs). Don’t forget to note the HyperHEPA filter, a powerful certified True HEPA filter that can capture even the ultra-fine particles, as small as 0.003 microns. With such power, IQAir GC MultiGas can purify all the toxic tobacco smoke, soot and viruses from your indoor air. For the capability, this IQAir GC MultiGas can cover up to 1125 square ft, so you can use it in both your home or the office. Remember that you should open all your doors for an air purifier to take effect (air purifier can’t work through walls). The New Edition fan power of IQAir GC MultiGas is one of the strongest at the moment, with an astonishing high CADR of 300 to 776 cfm and 5X ACH. This air purifier will clean your room in a matter of minutes, all thanks to the powerful fan. The Smart Sensor is also a must-have feature on the high-end device. In the IQAir GC MultiGas, the sensor is the most accurate you can have in the world, responding to the change of the air quality in seconds, and automatically adjust the fan speed that is most suitable for your room. You no longer need to control your air purifier anymore, just turn the IQAir GC MultiGas on and enjoy the fresh air. Previously in our list: Winix 5500-2. Though being Korean based, the Winix name is even more well-known than a number of native American air purifier brands. Their air purifiers mostly target at the low-range market, with decent fan power and stunning air filtration process. The Winix 5500-2 is the best air purifier for smoke you could get for under $200. For your money, you will get an incredible 3-stage air cleaning system from the Winix 5500-2 as below. Pre-filter – A washable pre-filter will help you capture the large particles of contaminants, from pet hair, pet dander, dust and pollen. It is attached with an Activated Carbon Filter which is made of high-grade granular activated carbon. As a result, the Advanced Odor Control Carbon filter is 93% effective against all types of smoke, odors and VOCs. True HEPA filter – The True HEPA Filter that captures 99.97% of down to 0.3 microns allergens, virus particles, pollen, mold and fungi particles. Winix PlasmaWave Technology – This technology is one kind of ionizers, which can further reduce the amount of pollutants. Can be switched on/off. Under-the-hood Winix 5500-2 has surprisingly good specs. The biggest highlight is the combination of True HEPA filter and PlasmaWave technology, which ensure the great performance against any type of pollutants. As the best budget air purifier for cigarette and cigar odor, Winix 5500-2 uses a high-quality Advanced Odor Control Carbon filter, that will clean the smoke as quick as possible. Yes, you will see the smoke disappear immediately. While being a low-range device, Winix 5500-2 packs a very accurate Smart Sensor, to detect the air quality and adjust the fan speed to suit the environment. This high-end feature is rare in the air purifier under $200, but with a Winix 5500-2, you will have a bang-for-buck air purifier. The room coverage of this Winix 5500-2 is one of the best you’ll find on an affordable device, up to 360 sq ft. The CADR rating is 243 Dust/ 232 Smoke/ 246 Pollen (cfm), which is as strong as others with double the price of this device. Staying as the entry-level at mid-range air purifier market, the Blue Pure 121 is a phenomenon, with such strong fan power that even matches the at least $700 air purifiers. For a best air purifier for smoke, the fan power is the top priority factor to check. Therefore, if you have more budget to pay for, you should not miss this air purifier. As the flagship of Blueair Blue family, the Blue Pure 121 delivers the unique 3-stage air cleaning system as below. Pre-filter – The fabric pre-filter of Blue Pure 121 is outside the air purifier and can catch the large particles. This pre-filter is washable or vacuumable. Particle filter – Instead of using a True HEPA filter, Blue Pure 121 uses a polypropylene fibers filter to help capture 99% of all allergens like dust, dust mites, pet dander, pollen and fungi (HEPA technology). Activated Carbon Filter – The Activated Carbon filter is added inside the Particle filter and effective against smoke, odors, gases and VOCs. There is nothing special in the air filtration system, as Blue Pure 121 uses a Particle filter, combines with the electrostatic filtration to deal with most of the airborne contaminants. Inside this Particle filter, Blue Pure 121 makes use of an Activated Carbon filter that weighs 3 lbs. So to say, with a Blue Pure 121 in your home, you will never have to stand the smoke and odors anymore. This air purifier may be the most ease of use air purifier you can have. It operates with only one button. Press it on, and you can enjoy the fresh air. Like we said earlier, the reason this Blue Pure 121 is one of the best air purifiers for smoke is thanks to its powerful fan. With the CADR rating of 400 cfm, and 5X ACH, you will hardly see the smoke in your indoor air for seconds. Sharp is a giant in electronics industry of Japan, and in the air purifier industry, the brand is very popular in Asia and Africa. That’s why you can’t go wrong with their powerful flagship – the Sharp FP-A80UW. To be one candidate in the best air purifiers for smoke, the Japanese brand brings up with a new and effective Anti-smoke technology. As one of the best air purifiers the brand has ever produced, Sharp FP-A80UW use 3-stage air cleaning system as below. Pre-filter – A pre-filter combines with an Activated Carbon Filter to capture the large particles of contaminants, as well as absorb the smoke, odors and VOCs. True HEPA filter – The True HEPA Filter that captures 99.97% of as small as 0.3 microns allergens, virus particles, pollen, mold and fungi particles. Plasmacluster Ion – This technology is one kind of ionizers. After purifying the air, the ions will turn into the water without emitting any ozone. Can be switched on/off. With a typical combination of Activated Carbon filter and True HEPA filter, the Sharp FP-A80UW can deal with any kinds of cigarette smoke, cigar odors and smell that linger in your house. But if only for that, this air purifier will not stay high in our list of best air purifiers for smoke. Yes, the stunning filtration of this Sharp FP-A80UW is the Plasmacluster Technology. In short, this technology will decompose any smoke particles, and change it into the water, which is returned to the air. 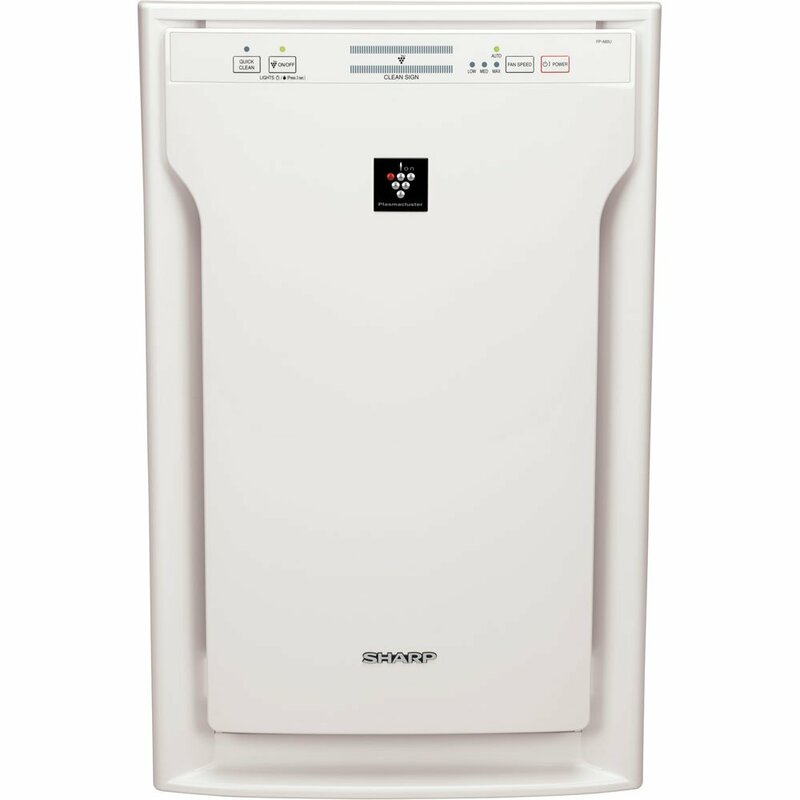 Beside the impress air filtration process, Sharp FP-A80UW has a good room coverage, too. It can clean a room of 454 sq ft, with the high CADR rating of 303 Dust/ 293 Smoke/ 360 Pollen (cfm). Finally, we are looking at a high-end air purifier, so the Smart Sensor is a required feature. You just only need to turn on the air purifier, and start to enjoy the life from now on. You can say goodbye to the smoke problems for the lifetime, as all air purifiers of Alen are backed up by a Forever Warranty, to commit that you will have a device that clean your air forever. The Alen BreatheSmart 45i is the latest device of Alen’s lineup, with customized air filter to clean all smoke and odors out of your home. Again, we have a 3-stage air cleaning system in this Alen BreatheSmart 45i. Pre-filter – A washable pre-filter to capture the large particles of pollutants. HEPA filter – With the Alen BreatheSmart 45i, you can choose between the HEPA-Fresh – with an addition of Activated Carbon filter, to deal with the household odors like cooking smells and light smoke. Or you can upgrade to the HEPA-OdorCell, that makes use Alen’s patended Molecular Conversion Powder, that can destroy the odors on a molecular level. Ionic filter – By emitting a cloud of negatively charged ions into the air, this filter will trap the contaminants back to the physical HEPA filter. Can be switched on/off. Both the HEPA-Fresh and HEPA-OdorCell are really powerful against all types of smoke and odors you have trouble with. When you see the smoke and odor is cleared after just 30 minutes, you will know that you have a good investment. Please note that the air filter of Alen BreatheSmart 45i is not a True HEPA filter. However, for an air purifier for smoke and odor, it really doesn’t matter. Talking about the fan power of the Alen BreatheSmart 45i, it has a large room coverage of 800 sq ft. The only downside is its low CADR rating, which results in taking longer time to clean your large room. Just like most high-end air purifiers in the market, Alen BreatheSmart 45i has a Smart Sensor, detect the actual air quality in your room and change the fan speed of the air purifier to meet the air quality’s need. Being supported by IndieGoGo, the Airdog X5 is the new air purifier to come in the U.S market in 2019. Despite of such young age, you will be surprised by both the number of awards for this air purifier and the power of its Ionic Wind technology. Pre-filter – A washable pre-filter that can trap the large objects of pollutant particles. Generating plate – This is where the Ionic filter of Airdog X5 works. It will emit a cloud of negatively charged ions into the air. Contaminants (which is positively charged ions) will be then electrostatically attracted to a charged collector plate. Collector plate – To collect the trapped contaminants. Final Remover – The last line of defense in Airdog X5, to make sure that no contaminant can escape to the fresh air. For many rigorous tests, we can confirm the performance of this Airdog X5. Of course, it is not as great as the True HEPA filter in terms of efficiency. But as an air purifier for smoke and odors, this air purifier is amazing to use. The best part of using this air purifier is you will save the annual filter cost for using any HEPA filter. Normally it will cost you from $50 to $100 each year, depending on the air filter you need to buy. Buying an Airdog X5 is an investment for a long time. In fact, this air purifier is mostly used for the room of 450 sq ft, with a decent CADR rating of 200 cfm. You will enjoy the fresh air 3 timer per hour by using this air purifier. Finally, this high-end Airdog X5 is a Smart air purifier, with both Smart Sensor and Smart Display App. Airdog X5 has real-time display powered by a built-in high-precision sensor keeps you updated for the air quality level in your house. Just open the Airdog Smart app, and you can remote control this air purifier. If you are looking for the high-range solution for your smoke and odors troubles, you can’t miss the Airpura – a brand which quite resembles the Austin Air, both from the price and the design. Right at its natural name, the Airpura T600 Tobacco Smoke Filtration has targeted at eliminating smoke in your home. This air purifier is perfectly ideal for smokers and/or smoking areas. Airpura T600 packs up with a powerful 3-stage air filtration as below. Pre-filter – A pre-filter named Tar Barrier will help you capture the large particles of contaminants, especially tar comes from the cigarettes. This filter is vacuumable and therefore can be used permanently. Activated Carbon Filter – This 3 inches Chemical gas and odor filter with high technology from Airpura to accelerate the binding of chemicals faster and thus remove them quicker. This Carbon filter can be 100% Coconut Shell or 17% Potassium Iodide + 83% Coconut Shell Carbon. HEPA filter – The Main Particle Filter is a HEPA Barrier to capture 95% of airborne particle down to 1 microns. Though Airpura T600 doesn’t have a True HEPA filter (because it is mainly for trapping tars), it has a 26 lbs of Activated Carbon filter. Compare to 12 lbs of activated carbon filter from IQAir GC MultiGas, it is safe to say Airpura T600 is one of the best air purifiers that completely absorbs the cigarette smoke. Without the True HEPA filter, this air purifier is still having a good performance rating against smoke and odors. There are many additional things in Airpura T600. You will have 4 casters for mobility to anywhere. The bottom line is the exceptional fan power with a CADR of 560 cfm. It also has a 360 degree air intake to cover a room of 2000 sq ft. This air purifier is perfect for a very large room, or even a meeting hall. Proud to be chosen by the U.S government, all products made by this well-known Austin Air brand are tested carefully before launching to the market. As one of the few medical-grade air purifiers in the world, let’s see how Austin Air HealthMate Plus dares to claim title of “The only Clinically Proven, Medical Grade Air Purifier”. Austin Air HealthMate Plus have the most formidable 4-stage air filtration system like this. Medium Particle Pre-filter – Adds a layer of filtration to double the removal of molds, spores and pollen from the air. Activated Carbon filter – A powerful Activated Carbon, Potassium Iodide Impregnated Carbon and Zeolite to help remove VOCs, formaldehyde, benzenes, chemicals, gases and odors. True HEPA filter – With double the pre-filter, the True HEPA filter will only need to capture the tiniest particles. This medical-grade True HEPA filter can capture 99.97% of as small as 0.3 microns allergens, virus particles, pollen, mold and fungi particles. 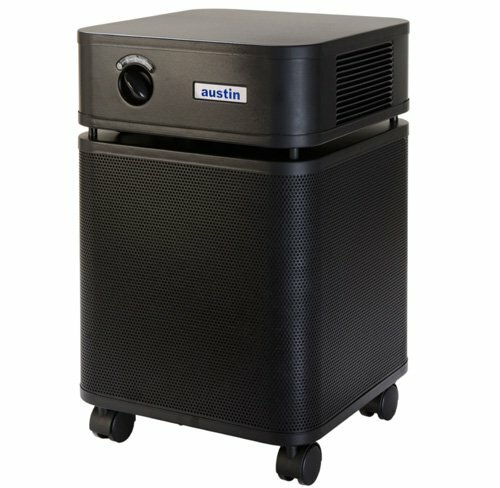 With a 60 sq ft of True HEPA filter and double the pre-filter, it is hard to go wrong with the Austin Air HealthMate Plus. It is capable of cleaning the air through even the tiniest particles down to 0.1 microns in size. In terms of the sheer power, we believe that the Austin Air HealthMate Plus is definitely one of the best air purifiers in the world. Most importantly, the advantages of Austin Air Healthmate Plus is within its Activated Carbon filter. 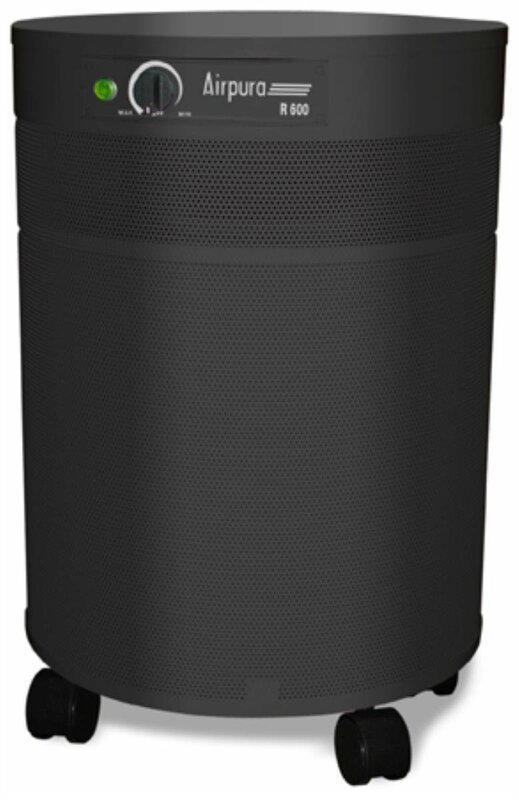 With 15 lbs of granule carbon filter, this air purifier can easily absorb smoke chemicals and odors. In 2016, this Austin Air Healthmate Plus is widely used to help protect thousands of residents of California against the effects of the natural gas leak. As you can see, the power of this air purifier against smoke is undeniable. Also, this air purifier is great with the 360 Degree air intake to help increase the efficiency of purifying polluted air. The last but not least, the room coverage of Austin Air HealthMate Plus is 1500 sq ft, and the CADR rating is 400 cfm. With such fan power, you will no longer live in smoke and odors for sure. Just like Winix, Coway is a Korean brand, but this brand is the No.1 brand of air purifier in its native country. As with the AIRMEGA 400S, this brand will continue to show up in any list of the best air purifiers in 2019. The reason why this AIRMEGA 400S is a best air purifier for smoke is because of its powerful 2-stage air cleaning system. As you can see, the AIRMEGA 400S has high efficiency against the smoke and odors because it has doubled the size of a normal Coway Activated Carbon filter. Usually a bigger size air filter means better performance rating in large spaces, typically from more than 300 sq ft. Yes, we said large spaces, and the AIRMEGA 400S can cover an area of up to 1560 sq ft, with a reliable CADR rating of 340 Dust/ 350 Smoke/ 400 Pollen (cfm). Only one downside, the ACH of this air purifier is only 2X for such large room, and you will only enjoy the fresh air once every 30 minutes. That’s right, it is longer than normal. For a high-end device, especially made by Korea – a country of innovation, the AIRMEGA 400S has both the Smart Sensor and Smart Wifi connectivity function. Using the Coway IOCare Mobile app, you will receive the real-time air quality notifications, also with a filter lifetime monitoring, and scheduler to control this AIRMEGA 400S. If we follow the history of air purifier brands correctly, we will know that Blueair is a giant in this industry for 20 years. You can easily find a big-size Blueair air purifier cleaning smoke in a hospital or supermarket today. 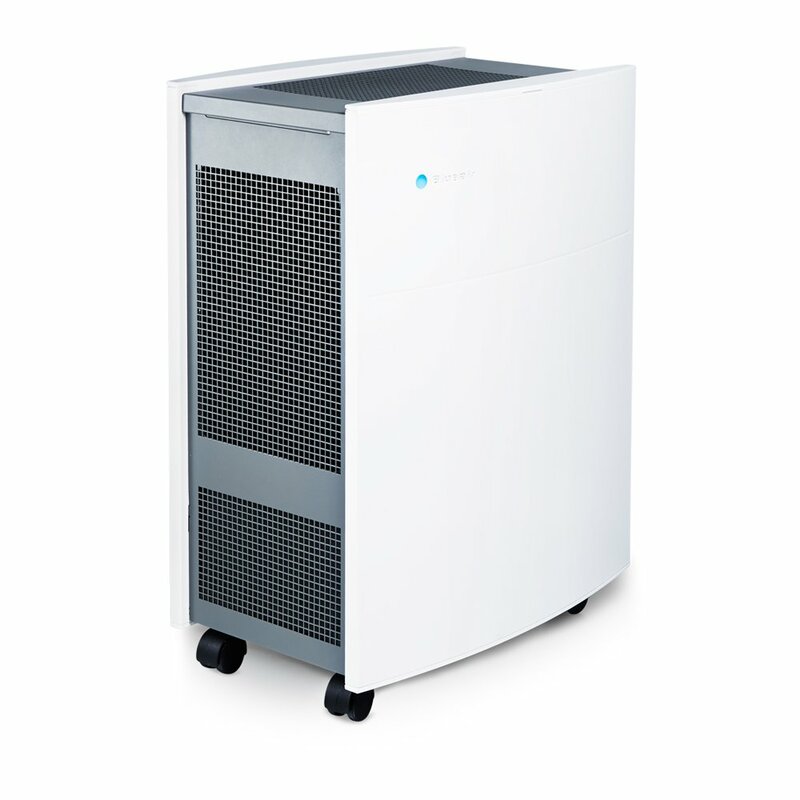 For our list of best air purifiers for smoke, it is reasonable to choose the Blueair Classic 605. 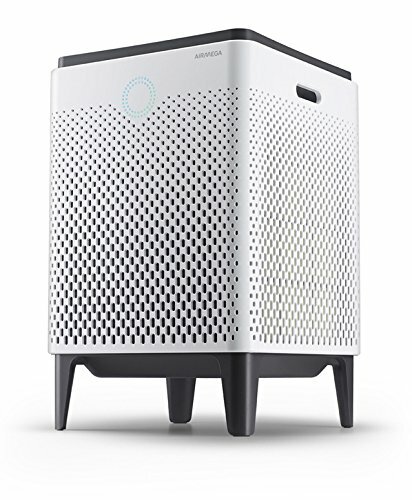 Blueair Classic 605 is a powerhouse air purifier with only 3 sets of an unique SmokeStop filter. The most powerful air purifier in this Classic family of Blueair can capture 99.97% of as small as 0.3 microns allergens, virus particles, pollen, mold and fungi particles through a process of electrostatic and mechanical filter. Moreover, this air purifier is perfect to remove most of the contaminant particles in toxic smoke, leave out the fresh air for you and your family. Blueair has improved their air filter to make it less dense, therefore requires less air pressure and allows high air flow efficiency. We experimented this Blueair Classic 605 with little to no noise at the lowest setting, but is still noisy at high setting. 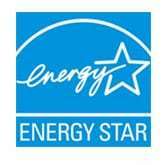 The thumb-up reason to choose this air purifier is the rating of Energy Star. It is optimized to save energy, with an automatic smart sensor to adjust the fan speed to the lowest settings. 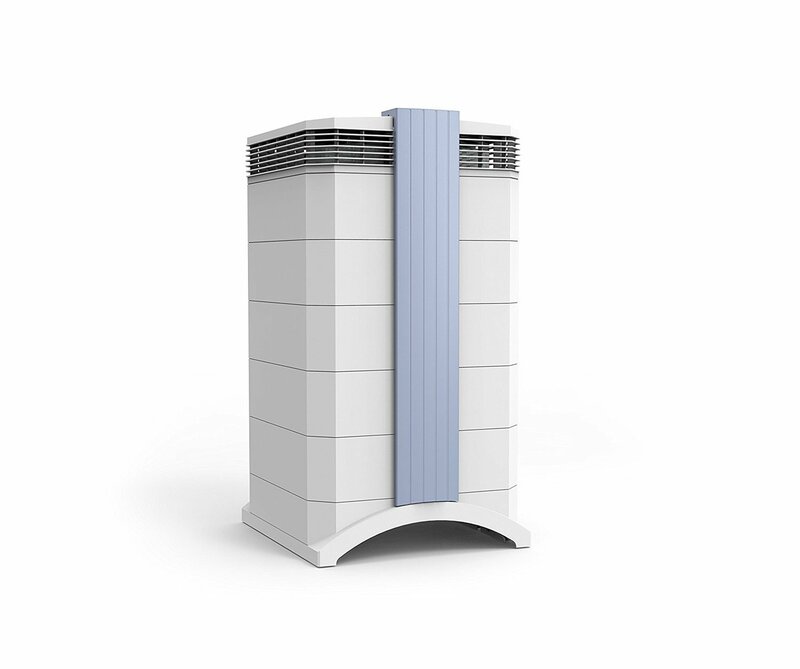 And with the CADR of 500 Dust/500 Smoke/640 Pollen, Blueair Classic 605 is perfect for a coverage of up to 765 sq ft. This air purifier doesn’t have a Smart Sensor, which is quite a disappointment for its price. However, you can control the Blueair Classic 605 via both Smart app and Alexa Voice Control, a feature which is not popular in even the modern air purifiers in 2019, so we’re still happy with this Blueair Classic 605. We always know about the risk of secondhand smoke. Many studies and researches show that at least 2.5 million non-smoker people have died from health problems of cigarette smoke. If you are a smoker, it is dangerous for your family member, especially your children if they expose to the cigarette smoke for a long time. Tobacco smoke is made up of VOCs, which is dangerous for both adults and children’s health. The possible health problems you may encounter for smoking is heart attack, brain damage, asthma attack and even lungs cancer. The smelly odor from cigar and tobacco may cause bad breathe and stained teeth for smokers. That’s why you need an air purifier for smoke. According to some studies, HEPA filter from air purifier is able to capture most of the contaminant particles. 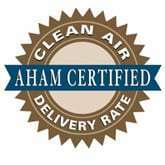 The certified True HEPA filter can even trap 99.97% of pollutant particles down to 0.3 microns. 1, Do air purifiers help with smoke? 2, Do air purifiers remove odor? When you find an air purifier for smokers, you may have high chance to encounter the word of “HEPA filter”. This term stands for “High Efficiency Particulate Arresting”, the most common filter in air purifier today. At their core, HEPA filter is an ultra-fine, glass-fiber filter. Through the mechanism of diffusion, interception and inertial impaction, HEPA filter can capture microscopic particles easily. Most people believe that HEPA air filters function as physical barriers that operate on a go/no go basis. The pollutant particles that are larger will be trapped and particles that are smaller than the filtration can pass right through. However this is just the interception process of HEPA filter. To ensure that these contaminant particles like cigarette or cigar smoke stay in the filter, the mechanism of diffusion will be used. There are many acronyms for HEPA, for example HEPA-like or HEPA-type. However, if you want an ultimate protection, you need one with label of “True HEPA filter”. This label is only for the air purifier which has been certified and tested to capture 99.97% of the 0.3 microns particles. The size of 0.3 microns is chosen because it is the tiniest particle’s size to get into your lungs. While HEPA filter is powerful to purify the air around you, this air filter won’t help you with things like cigar odors or cooking smell. That’s why you need to know of Activated Carbon filter. Activated Carbon filter is made up of a special form of activated carbon consisting of millions of tiny absorbent pores. These tiny pores increase the surface area of the medium and allow gaseous cigarette smoke to be collected through a process of adsorption. In an air purifier for smoke, this air filter can absorb and neutralize volatile chemicals on a molecular basis such as cigarette and cigar odors. Once trapped, these contaminant particles will be changed from gaseous phase into solid phase. Then it will be collected by other filters, most commonly the HEPA filter. We hope that you now understand the process of an air purifier for smoke. Also, you have right in your hand the top 5 best air purifier for cigarette and cigar smoke. It is up to you to invest in one of our list now. Thank you.